Splash With Panache: FIRED UP! Join us in the Yvette Foster Dining Hall at the Milne Family Commons on the Horizons campus in South Windham for a fabulous evening of fun and celebration! Thank you all who have registered for our Gala. We are currently sold out and look forward to seeing you all at the event! * If you have already verbally commited to a seat and have not yet paid, please contact Maria Pallein directly at MPallein@horizonsct.org. There are still two ways to support Horizons and our event without attending. There is still a little time to become a sponsor and get an ad in our colorful program. Secondly, you can purchase a beautiful pearl necklace and be entered for a chance to win a fabulous jewelry package, details below. Buy a Majestic Magic Box containing a beautiful pearl necklace for $100. (If you cannot attend the Gala, this is a great way to participate!) Each box represents a chance to win the FIREWORKS PACKAGE, a stunning custom-designed three piece set consisting of a Rhodolite Garnet pendant, matching earrings and ring. The garnets display brilliancy and fire with a beautiful color of red and pale violet. The pendant and earrings are enhanced with diamonds and the stones are all set in 14kt white gold. Donated by "Simply Majestic" in Mystic, CT, the set is valued at $2000 and will go to the one lucky winner whose Magic Box contains the BLACK pearl necklace! You don't have to be present to win and you may buy as many chances/necklace boxes as you'd like. Individual tickets and tables can be purchased online. If you cannot attend on the 28th and wish to make a cash donation, please use the DONATE NOW button on this page. Horizons is partnering with Foxwoods Resort Hotel and Casino to hold 12 rooms at The Fox Tower at a reduced cost for the guests of Horizons’ Gala. Rooms can be reserved in advance, on a first option basis, for the night of the Gala, Saturday, April 28th. The group rate is $229.00 per room. Please be advised that all rates quoted are per room, per night, single or double occupancy. A charge of $25.00 will be added for each guest room over double occupancy. Resort fee has been waived. Free transportation will be provided from the hotel to the Gala and back! A credit card is required to guarantee and reserve the rooms at the group rate. 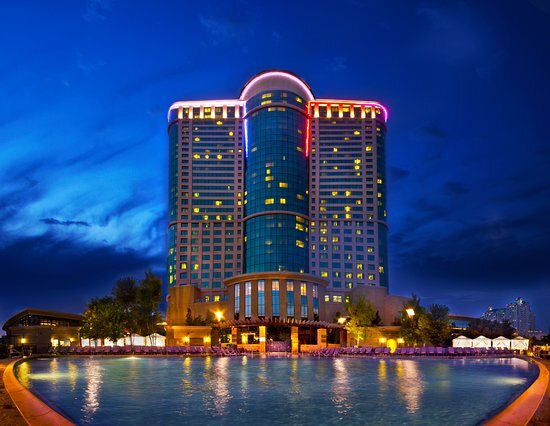 Guest room reservations can be made directly with Foxwoods Resort Casino. You can support the Horizons Gala by taking out a full-, half-, or quarter-page ad in our program. Or make an even bigger mark with a Banner Sponsorship and get a large colorful 2' x 8' banner featuring your logo and an original Kerri Painting (kerriquirk.com), plus a full-page program ad. With any Sponsorship, we will also place your company's logo on our web site linking back to your own web page and developing new business. We can track how often your logo is viewed and clicked to see just how many people are accessing your site. For more information on Becoming a Sponsor, click the Donate Now button on this page. Check out our fantastic Auctions Items! Click Here to see ALL Live Auction Items! St. Croix Week Long Getaway - Thrill on the Hill! Chef-prepared Dinner for EIGHT in Your Home! Copyright © 2003-2019 Horizons, Inc. and BiddingForGood, Inc. All Rights Reserved. Designated trademarks and brands are the property of their respective owners.